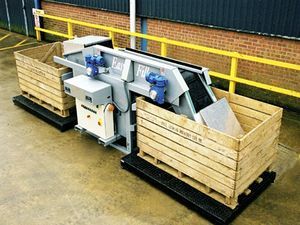 Easy-Fill' twin box fillers help make Tong Peal number one in box handling machinery. One reversible crop conveyor with lowering ends makes box filling 'easy', fast and gentle on the crop. Fully automatic operation via a micro processor and crop sensors. Manual control via push buttons in the electric panel door. Heavy duty pvg endless belt with small cleats and rubber finger crop hoods gently lower the crop into boxes. Even filling of the boxes is made by the conveyor traversing over the box. Capacities up to 30 tons per hour can be achieved subject to the forklift operator and box movement management. A Feed Elevator is available if required. Fitted with a 750 mm wide belt with a circular infeed hopper, a 'swan neck' section at the top and powered by a variable speed motor the elevator gives a high capacity gentle feed to the box filler. The elevator is adjustable in height on a winding handle, has forklift tubes and can have caster wheels. There is an auto link from the box filler to the feed elevator. Should the filler stop for any reason then the elevator will also stop.